A midden is the term used by archaeologists for a garbage or trash heap. Archaeologists are known to love middens because of the rich cultural finds uncovered in them. So when it was revealed that Jim Parker was a project manager for an archaeology company at one point in his career, it made sense that he moved into the disposal industry, too. 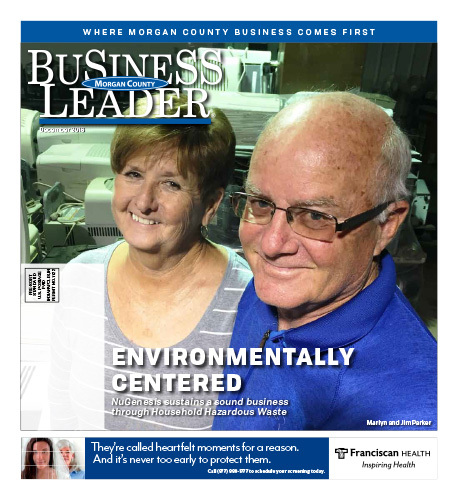 Jim and his wife Marlyn are the co-owners of NuGenesis, Inc. in Mooresville. Environmentally Centered NuGenesis sustains a sound business through Household Hazardous The name of the company may not be familiar, but if you have ever heard of or attended a Tox-Away Day in your community, you have been in contact with it. NuGenesis is the only company that specializes in bringing together various disposal and recycling services and is Indiana’s largest provider of community Tox-Away Day Collection programs.